Here’s the most comprehensive book of monologues ever compiled, with 144 audition pieces conveniently grouped into historical “periods” from the classical to the contemporary. The monologues selected for each historical period are representative of the competitive material you might expect to discover at auditions. Each selection also includes a brief character analysis. This text is more than just a fine collection, however. It’s also a “how-to” guide, with the first chapters presenting a blueprint for preparing auditions and selecting audition materials. Read more...The fundamental performance principle that Ratliff develops in the introductory chapters suggests guidelines and strategies to enrich your distinct and individual audition style. There is also a chapter of interesting “non-dramatic” monologues adapted or edited from sources other than theatre playscripts that should challenge your skills in interpretation and characterization. 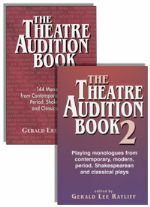 Finally, there are a number of valuable resource materials that include selected readings, a survey of period dates, and a glossary of useful audition terms. Based on the popularity of his first book of audition monologues (See above. ), Ratliff has compiled another outstanding collection of monologues taken from contemporary, modern, period, Shakespearean, and classical plays. The monologues (and duologues) are conveniently grouped in historical periods and include a brief summary of the historical period, basic approaches to analysis and interpretation of scripts, and performance styles. One chapter, for instance, focuses on playing the “classical” Greek style, another on Shakespeare, the next on playing selected theatre period styles, and still another on playing contemporary monologues. These chapters also explore the skills necessary to visualize the dramatic and theatrical elements in an audition monologue. In addition, there are a number of vocal and physical exercises included to promote ease of movement and distinctive vocal variety.